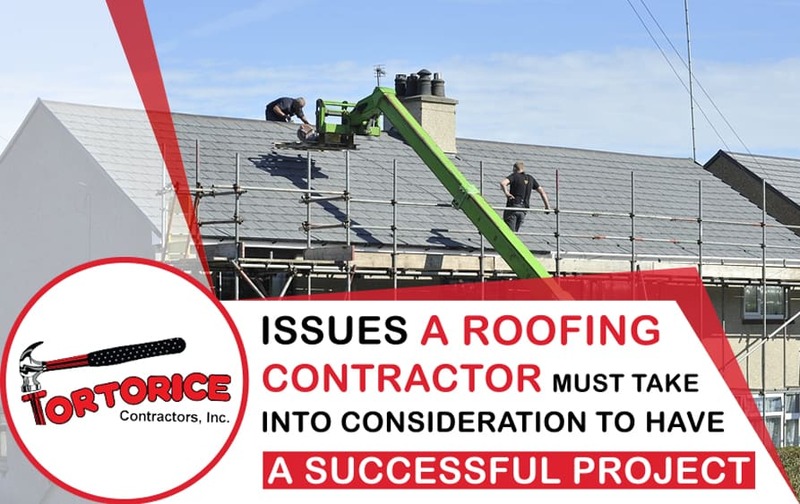 Issues a Springdale Roofing Contractor Must Take Into Consideration to Have a Successful Project - Tortorice Contractors Inc.
Roofing is an essential part of any building and construction related project. Because of the sensitivity associated with roofing, property owners are often advised to seek help from a qualified and reputable Springdale roofing contractor in order to get the best results. Aside from the need to be cautious, roofing is an expensive project and an expert assigned to handle the project must be chosen carefully for the entire project to succeed. So, if you need a roofing contractor it’s always advisable to research extensively and do background checks so you pick the roofing contractor who has the right talent with vast skills and experience. Because of the costs associated with roofing, most roofing contractors are always keen to ensure they provide a good service that will ensure property owners get good a return on their investment. Thankfully, with just the click of a button, you are presented with numerous qualified and experienced roofing contractors who can effectively handle your project. Aside from the client, a roofing contractor should also be preoccupied with preparing for the roof installation and determine what issues need to be addressed before the project begins. At this stage, there is usually a lot of consultation between the client and roof installer beforehand in order to ensure all issues are clarified. With the increasing levels of competition in the industry, every roof installer has to ensure they remain at the top of the game and that their work is completed professionally according to the client’s expectations. Below is a list of critical issues any roofing contractor in Springdale must address beforehand to ensure that a project proceeds smoothly and goes as initially planned. Before beginning any roofing project there must be an accurate and well thought out budget for the entire project. Working without a budget is inconveniencing for both the contractor and the client. On one hand, the contractor might not be able to properly execute their mandate because of a lack of sufficient budgetary provisions. At the same time, a client may have to keep being requested to add more money to the project to help pay for unforeseen expenses since no prior planning and budgeting was done. Working without a budget means a roofing installer loses focus of the project and may end up not taking care of important issues. To ensure a smooth installation exercise, every contractor must meet and discuss with their client what kind of budget is needed and have everything in place before beginning to work. When budgeting is not done chances are high that a roofing contractor Springdale may resort to shortcuts, especially if the client wants satisfactory work yet failed to provide the required financial resources. While it is the duty of a client to provide the required financial resources to facilitate a project, a contractor on the other hand should ensure the right materials are purchased in good time. When buying items needed for the project it is the responsibility of the contractor to ensure materials purchased are of high-quality, and come in the right quantities. It is always important to work with a professional because there are certain material acquisition procedures which need to be strictly adhered to. Failure to invest in good materials may compromise the entire roofing project which is risky. A roofing contractor should advise their clients on the best materials that should be used for building a high-quality and safe roof. Professionals are always aware of the best and reputable suppliers of roofing materials that meet industry recommendations. Roofing projects are usually labor intensive and therefore need to be handled by a well-established Springdale roofing contractor who has a team of skilled professionals. Before accepting any contract, a contractor is supposed to evaluate the work area, and the type of roof to be built in order to determine what kind of manpower is needed to get things done right. Large roofing projects can be challenging so there needs to be enough people with different specialties on site to ensure tasks are done in a smooth and organized manner. It is unwise for a contractor to begin working on a roofing project before taking into consideration if they will need extra labor on site. In most cases roofing contractors who fail to address labor issues in advance either fail to deliver quality work or stay on site longer than the prescribed period of time. Today, the demand for professional roofing services has increased because of the high number of buildings being constructed and those that are in need of renovation. Roofing is a sensitive exercise that requires sophisticated machines and equipment to realize high-quality workmanship. Aside from simplifying work, having equipment on site helps to improve work quality and boosts safety. It is important for every Springdale roofing contractor to determine well in advance what type of equipment needs to be deployed on the site.